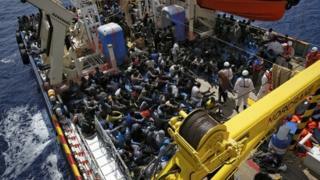 The Italian navy and coastguard say they have rescued about 4,500 migrants from dozens of small boats in the Mediterranean during the course of Thursday. A woman's body was recovered from one of the vessels. More favourable weather conditions have resulted in a major increase in the number of people leaving north Africa. Many of the unseaworthy boats were spotted about 40km (25 miles) from the Libyan coast. "We saved a total of about 4,500 people in about 40 rescue operations," a coastguard spokesman told AFP news agency. He added that the operations were continuing and the number might rise. More than 10,000 people have died crossing the Mediterranean to Europe since 2014, according to United Nations figures. An agreement between Turkey and the European Union to halt migrants from travelling to Greek islands has reduced boat arrivals by 98% during the first five months of the year, compared with the same period in 2015, the International Organization for Migration (IOM) says. But arrivals in Italy continue at about the same rate as last year, the IOM added.